The role of admins in today’s businesses has evolved to include being a first-line “intelligence-gatherer” for their offices. The American Society of Administrative Professionals (ASAP) has announced a major expansion of the Exhibit Hall at the 2016 Administrative Professionals Conference (APC). The record-breaking number of best-of-class companies exhibiting at the event has doubled from 2015. Hundreds of administrative professionals and executive assistants attending the APC will explore new solutions, products, and services offered by leading corporations. 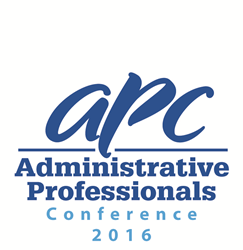 In its 24th year, the APC is the largest, most comprehensive annual training experience for administrative professionals across the nation, and will be taking place this September 18-21st at the prestigious Hyatt Regency in downtown Chicago. The presence of some of the best-known brands and products in the APC exhibit hall is a major draw for the admin community; the role of admins in today’s businesses has evolved to include being a first-line “intelligence-gatherer” for their offices. With their purchasing influence and ability to recognize the best office products and solutions, APC attendees will benefit from the expanded variety of sponsors and exhibitors on the exhibit hall floor which is open for two days of the conference, September 18 & 19. Gold Sponsors include Seamless, AmTrav, and the SmithPollin Group, with new Silver Sponsor Revolution RFP joining the sponsor list. Services provided by these premium sponsors include an online office catering service from local restaurants, comprehensive online business travel tool, and event and meeting management and design resources. In addition to the premium sponsors, dozens of exhibitors will showcase their products and services from their booths, and will participate in daily APC promotions with raffles and giveaways. APC attendees will have the opportunity to connect with service and solution providers after the conference as well. To see current exhibitors and sponsors at the APC, visit http://www.apcevent.com/exhibitor-list/.